In an article entitled "Israel releases list of Palestinian prisoners to be swapped" [CNN, October 16, 2011], CNN's Frederik Pleitgen reports on Israeli anguish over the decision, announced that day (Friday), to free more than a thousand terrorists from Israeli jails. 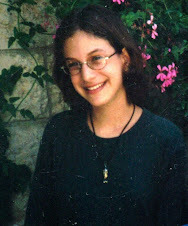 Everyone wants to see Gilad Shalit safe and well and back home but I think there is a real failure to understand the price that is being paid, and the price is phenomenal," said Arnold Roth, who lost his daughter Malki in the Jerusalem suicide bombing in 2001. "We are releasing people who have dedicated their lives to killing Jews and Israelis." 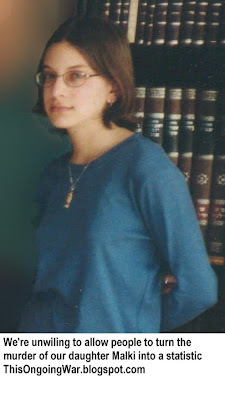 Roth opposes the announced release of Tamimi, who was sentenced to multiple life sentences for her involvement in the August 2001 bombing of a Sbarro pizza restaurant in 2001, in which 16 people were killed.